The photo above shows raw forgings for Compass René Herse cranks. Perhaps you will have spotted that they are all different: Their length varies in 6 mm steps. We introduce René Herse cranks now available in 165 mm and 177 mm lengths, in addition to the 171 mm we have offered in the past. Why 6 mm steps? Everybody seems to agree that crank length differences of 3 mm or less are unnoticeable even for the most discerning cyclists. If you usually ride 175 or 180 mm cranks, our 177 mm will be perfect for you. The 171 mm covers 170 and 172.5 mm. And if you prefer shorter cranks, we now offer 165 mm as well. Together, these three lengths will satisfy 90% of cyclists. Last autumn, I went to Taiwan to discuss the final phase of this new project with our suppliers. I love visiting the people who make our components. The man on the right is our engineer, who works full-time in Taiwan to supervise the production of our components that are made there. (Many other components are made in Japan, and a few are made locally in Seattle.) In the center is one of the engineers from the CNC company who machine our cranks and chainrings. Seeing our components being made is exciting. Like most high-performance cranks, the Compass René Herse cranks are forged. It’s a very involved process: You need a huge forging hammer (above). For scale, you can see two workers in the photo. On the right you see two pallets with raw aluminum pieces that will be turned into components. The long orange tunnel is an oven to pre-heat the parts. You heat the aluminum a little bit to make it more ductile, so it flows better when you smash it with the big hammer inside the tall machine. The “hammer” slams down onto the aluminum shape with a force of more than 1000 tons. That is the weight of 25 fully loaded semi-trucks! The forging dies are stored in long racks. These are the tools that are smashed together, with the aluminum in between, and the result is your part. It’s that simple, except the forging dies must withstand huge forces during the forging process. No wonder they cost so much! For huge production runs, forging can be less expensive. You waste less aluminum, because you only use as much as as you need for the shape of the part. (This also is better for the environment.) And forging is fast – just a second or two per part, rather than 30 minutes or more on a CNC machine. If you can amortize the cost of the forging die over millions of parts, it’s quite inexpensive. For small runs, the forging dies add significantly to the cost of each part, so CNC-machining usually is cheaper. Forging makes a stronger part. Forging reshapes the “grain structure” of the aluminum, whereas machining interrupts it. Imagine a part made from wood. If the wood grain runs the same way as your part, it will be very strong (forging). If you cut across the grain when you make the part, it will be very weak (machining). High-end bike parts are made in small numbers, so forging is more expensive per unit. However, the higher strength means that forged parts need less material, so they are lighter and more elegant. Most small crank manufacturers use a combination of forging and machining. The reason is simple: They want to make multiple crank lengths from the same forging die. That is a compromise, because the grain structure is interrupted right where the crank can break (at the pedal eye). When you machine a crank to length, you lose many of the advantages of the forging process. Above you see the forging dies for the René Herse cranks. They look like negative imprints of the cranks. This is called “net-shape” forging, and it is a better way to make cranks. The advantage: You don’t machine off anything that would interrupt the grain structure. The disadvantage: You can make only one crank length from each forging die. We use net-shape forging because it’s the only way a lightweight, classic crank meets the highest EN “Racing Bike” standards for fatigue resistance. We know that our Compass René Herse cranks are ridden hard, and we want to make them as strong as possible. This means that for each crank length, we need a new forging die. It’s expensive, and we thought long and hard before adding new lengths to our program. If you look carefully at the two raw forgings above, you’ll notice that we didn’t just change the length. We also added a little material to make the 177 mm cranks a bit stronger. Longer cranks have a longer lever arm for the pedaling forces. And taller riders tend to push harder on the pedals (but spin at lower cadences). Two reasons why they need stronger cranks. When you machine cranks to length, the longest cranks are also the weakest. It’s an additional disadvantage! With net-shape forging and three raw forgings, we also need separate fixtures for each crank length, when the threads and other details are machined. Adding new crank lengths is a large project! But it’s worth it: We want our cranks to be the best in the world. This means that we will not compromise on their performance or quality. The new lengths aren’t the only change for the Compass René Herse cranks. We also went to a stronger aluminum. The 6066 aluminum we used until now offers great corrosion resistance and is easy to work with. That is why it’s used extensively in the bike industry. It’s also plenty strong for most riders. 2014 alloy is ideal for making cranks, but the heat treatment is more difficult than with other alloys. We worked with our suppliers to ensure that they mastered the process before using this alloy in our cranks. We have tested multiple samples of the new cranks, and they exceed the most demanding standards (the afore-mentioned EN “Racing Bike” standard). We are now confident to offer them to our customers. We now have all three lengths in stock. They are available as single, double, triple, and even tandem cranks (above), with chainrings between 52 and 24 teeth. They are compatible with drivetrains from 5-speed to 10-speed. When you enjoy the Compass René Herse cranks on your bike, you know that you aren’t just riding one of the most beautiful bike components, but also one of the best-performing. We feel that this is in the spirit of René Herse. His insistence on the highest quality and attention to detail earned him the nickname the “Magician of Levallois”. Click here for more information about Compass René Herse cranks. Interesting detailed essay. Thank you. Would also be nice to have 150 or 155mm rear stoker cranks for the under 5 foot stoker crowd. I would imagine this crowd is pretty small. Can not be better than that. Would make even a carbon bicycle look good. I was one of those commenting, when You introduced them, about longer cranks. Meanwhile I have changed most of my bikes to 185 mm cranks, so sadly they are to short for me still. Except maybe single speed for my next commuter bike, when my present one finally needs to be replaced. Thank you for the very informative explanation of the production process, I learned a lot from that. One additional question although: After the crank arm is forged, the manufacturer wil need to polish and finish the surface and more important, drill holes and cut threads for the pedals, the square taper und the chainring bolts. How does this maching affects the stability, flexibility and longevity of the crank? Good question! If you design the crank properly, the machining will not affect areas where cranks usually break. The grain will be interrupted (it’s inevitable). but it’s not a problem. The polishing actually makes the crank stronger, as it eliminates stress risers on the rough surface. On our Instagram is a photo that shows how little machining there really is. Thank you for walking back from one size fits all and embracing longer lengths! In the last few years, I’ve settled on 177.5mm as just right for my height (and my knees). Few compact doubles are made in this length. Now I can look forward to an aluminum crankset as beautiful as it is well made. Thanks. We try hard to offer differences that matter, rather than what people expect. When some people told me they needed a 172.5 instead of the 171 we offered, it was hard to see the necessity. However, I can believe that many riders feel a 6 mm difference. Your getting there kid, all tall boys are just waiting until there are more lengths available. If all the “tall boys” could settle on a single length – say 190 mm – then it might be possible. What length would you like to see? I ride 200’s at 6’6″ but can make it work at 190. It’s a small but pretty captive audience! Our (and your) problem is simple: The high cost of the forging dies must be amortized over smaller runs. This adds significantly to the cost of the cranks. 200mm for people 6’5″ or taller please! Can you explain a bit more why machining of longer cranks into shorter cranks would be so bad? 1. Those manufacturers who follow that practice need to start with the longest cranks they make (that’s what the forging die is made for). Let’s say 175mm. 2. If they want to make shorter cranks, they move pedal axle hole closer to the spindle, then remove the excess material by machining. If they make 172.5mm cranks, they have to remove 2.5mm of material from the end of the cranks. For 165mm cranks, they will have to remove 10mm of material from the far end of each crank. 3. This extra material doesn’t provide much strength anyway (if at all). We are not talking about removing material from the sides of the crank, around the pedal axle hole, where it’s the thinnest, but from the far end of the cranks only. 4. If done properly (well-designed forging dies, remove only as much as needed, precision machine and polish) it shouldn’t impact crank arm strength at all. 5. Not to mention that how many cranks have you seen broken at pedal axle holes? Not many, I guess. It all depends. If you make a modern crank where the arm is as wide as the pedal eye, then you just cut off the end that doesn’t matter. But your crank will be heavy, unless you make a hollow forging (Shimano) or make it from carbon fiber (different manufacturing process altogether). Classic cranks neck down – their arms are thinner than the pedal eye. This is the part that is machined on all but the shortest lengths, and this is also a place where cranks tend to break. Here is a photo of a “multi-length” raw forging. Beyond that, many budget cranks use the same forging for different models, so they undergo extensive machining in the area around the square taper. I’ve seen cranks broken there as well. 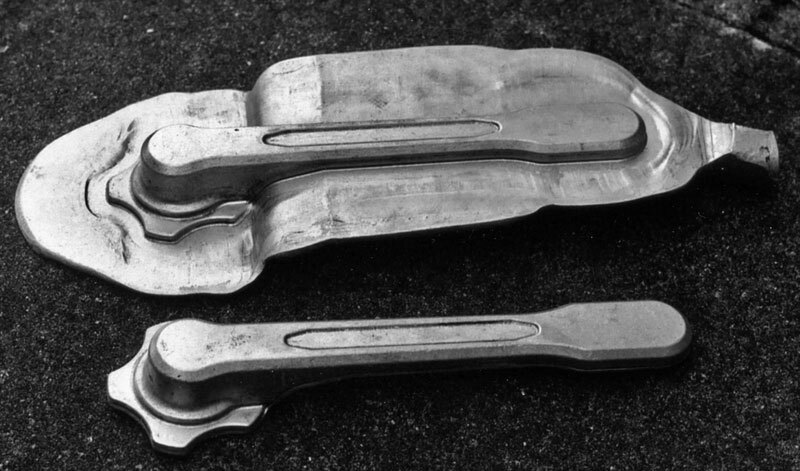 Back when they were widely used for “spirited riding” the classic aluminum crank design broke at the pedal eye with great regularity, Jobst Brandt broke dozens that way! It was partially a problem with the metallurgy and crappy manufacturing quality, but also from the pedal spindles not mating well with the crank and damaging it in the process of self-tightening. Modern cranks don’t break at the pedal eye anymore, the design and quality is completely different. Even the current square taper models don’t break there, though that’s largely because they aren’t attempting to be lightweight (Suginos still break all the time at the web in the spider). Interesting what you said about most people being unable to detect differences in crank lengths under 3mm. i recently lost a potential sale of a bike due to crank length. The problem? The bike was equipped with 175’s and the fellow told me that since he was used to 172.5’s, he wouldn’t be able get used to turning 175’s over. i had a Campagnolo Record crank that broke at the spider. Years later i learnt that it was due to their design flaw (they wouldn’t make good on replacement. The crank had under 2K km on it.) i do know one rider here who broke several of those cranks it the pedal eye, but he was a large, powerful fellow. Did Campagnolo use a forging process similar to yours on their cranks? Some curious questions: What is the distance (C-C) between chainrings? What is their with? 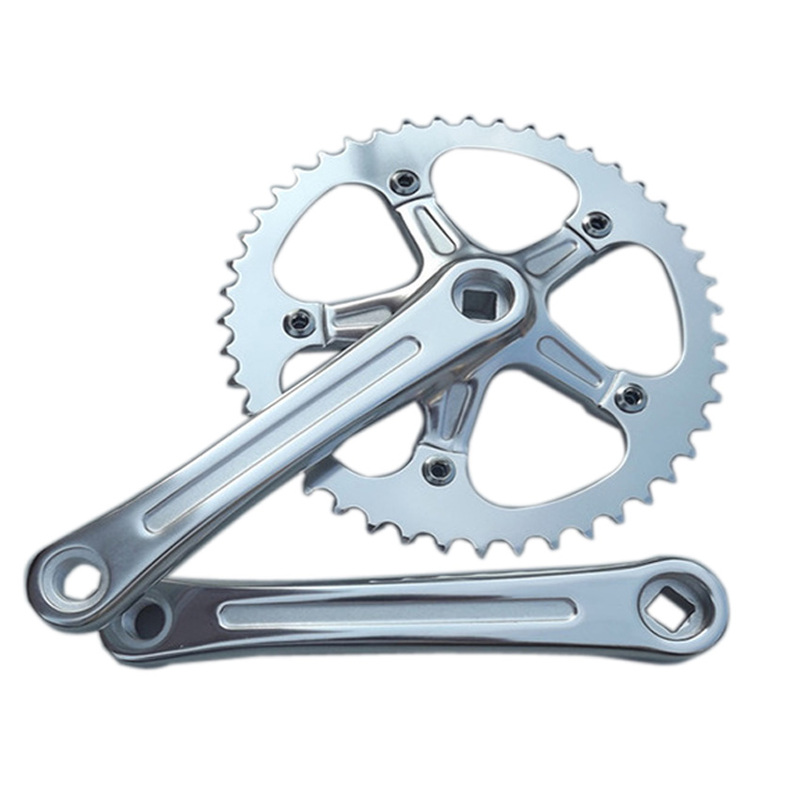 Is the crankset compatible with 8/9/10/11 speed chains and indexed shifters/brifters? The chainrings are spaced for 8/9/10-speed (but not 11-speed). I’ll add that to the blog text, because you are right, it’s important. They work with indexed shifters. The double chainring cranks work with STI, SRAM and Ergopower, but the triples don’t. You can read here why. Regarding the comment that Herse triple cranks don’t work with Shimano STI, SRAM and Campagnolo Ergopower shifters, I am wondering why this is the case with Campy Ergopower shifters. I am a longtime user of Chorus 9- and 10-speed Ergopower shifters with triple cranks (Campy Triple Comp with 24/39/49 TA chainrings on a single, a Sugino crank with 28/44/56 rings on a tandem). The Ergos shift these cranks very well. The left-hand shifter is not indexed and allows the chain to be moved as far to the right as needed to accomplish the shift. It seems that the latest Ergopower triple shifters don’t do complete shifts any longer, but instead rely on a pin to pick up the chain. That ensures that the shift happens only at the pre-defined points on the ring, but without ramps and pins, the chain doesn’t get picked up by the next-bigger ring. Fortunately, it’s not a problem with doubles, whether Shimano STI, Campy Ergo or SRAM DoubleTap. Awesome! I can’t wait to be gainfully employed again. A set of these sweet cranks would be a great “you’re a productive member of society again!” gift. The deep flutes are fine when you forge them into the blanks. If you machine them, you weaken the crank. I don’t know why most “retro-styled” cranks don’t machine the flutes… except that apparently, the same forging dies are used for many different crank models. On the Compass website it states 110-113 spindle length for the bottom bracket. Could you elaborate on the variance or point me to a link. Chainline standards are shifting. Where the “road” chainline used to be 43.5 mm, many makers now use 45 mm. That makes it easier to build bikes (wider tread/Q factor leaves more room for beefy chainstays and wide tires), but it requires a 3 mm longer bottom bracket spindle. It’s easiest to explain in relation to road bikes now having 135mm hubs, largely for disc brakes. SRAM now makes slightly wider road cranks to maintain a ‘perfect’ chainline, Specialized follows that mindset too and has invented nonstandard workarounds to accommodate them. But the difference is only really perceptible with super-short chainstays, or if you aggressively cross-chain from the small chainring. Shimano doesn’t believe it to be a real issue. Cast metals are sferoidal in their molecular structure meaning a mass of microscopic balls welded together. It creates a very stiff, stable structure in all methods of force. But it will snap unexpectedly when its fatigue limits have been met. Forged alloys, including steel alloys, have a linear molecular structure that interlaces with each other. It is this interlocking molecular structure that makes forging a much tougher proposition for repetitive impact use. As Jan has pointed out the cost associated with forging is huge but his decision is in the best interests of producing a very high quality component that may outlive your lifetimes worth of cycling. Thank you kindly for 165 arms, offer 160 and I’d buy for sure. the design would not allow for crank arm shortening either would it? It’s difficult to get 160 or smaller in North America. I could order online from japan, but nothing like these beauties. 165 is still a bit long given my ideal crank arm length is 155. 170 is standard. I make do, but there are issues with riding long cranks with little legs, it affects the saddle height which affects other things. I have toe overlap on road bikes that a smaller crank arm length would deal with. I do have a vintage 160mm specialties ta crank, but it’s in the project pile waiting for resurrection. The french sizing issues with bottom brackets and specialized tools required have been a pain. Try the 165 mm… I doubt you’ll notice much difference to the 160s. For shorter cranks, TAs are a good choice. They used to go as low as 150 mm. The only special tool you need is the crank puller. The taper is JIS (the Japanese copied the French standard). You need a longer spindle than for modern cranks, but those are available (for example, with the SKF bottom brackets Compass sells). The bolts use standard wrenches. They are a bit underdimensioned, so be careful not to overtorque them. TA still makes chainrings. So it’s not that difficult to run one of these. Since they are machined to size, they aren’t as strong as some… but with short cranks, that is less of a concern, since the leverage you have is smaller. “On est clairement ISO” was the answer I got from T.A’s engineer at their Eurobike booth when asking which standard they officially used! The reason the two are so close is simple: Stronglight made the first modern square taper cranks in 1934, and thus set the French standard. Campagnolo copied Stronglight, but they weren’t too concerned to get it exactly right, since they assumed you’d use their BB with their cranks. So their taper was a tad smaller. The French standard became JIS, Campagnolo’s taper became ISO, but really, they are almost the same thing. These look great. Thank you for sharing the process, and thanks for putting forth the effort to make such nice cranks. Great info and a lovely product – thanks so much for persevering! I noted a reference here and in a previous entry about “wasted” aluminum. My understanding was that aluminum was very recyclable, and that recycling it used a mere fraction of the energy required to refine it. I’ve heard it said that aluminum is one of the most-recycled products in the world. If this is true, it helps explain why CNC machining has taken over – the waste product would still have considerable value and that would lower the final cost. The huge investment in forging dies can be avoided, at the loss of the inherent benefits. Recycling still uses a lot of energy, and it turns high-grade aluminum into low-grade aluminum, unless you can separate the alloys carefully in a huge industrial setting. The reason CNC-machining became popular in the 1990s is the relatively low cost of used CNC machines. Much U.S. manufacturing left for other countries with lower wages, and the machines were put up for sale. At Hahn Rossman’s shop, we have a CNC machine for prototyping – a huge thing that was worth hundreds of thousands of dollars when it was new. Now, moving it costs almost as much as buying it. High Sierra, Zinn and Lightning currently go pretty darn long. The only way to make such long cranks economically is to CNC machine them. You have to beef them up a lot if you want them to be safe, but it’s the best option for such small production runs. As somebody said, demand is very small – you need a custom frame to ride them, otherwise, you get pedal strike in the corners – but those who want them are willing to pay a high price. Aware it may just be me, but I wonder if there is any interest out there for toothless outer rings – maybe 42 – 48 – for 1x drive trains. My 1×6 commuter currently is set up that way with a TA Carmina. I’ve not experienced any chain drops shifting and it’s nice to have a barrier between pants, shoe and chain. I like chainguards like that for cyclocross. I made a set by cutting and filing the teeth off a set of chainrings. It took about 20 minutes each. As to offering them as standard models, we already manufacture and keep in stock 17 different chainrings… We’ll add more if many riders need them. I also had a modern (though inexpensive ) crank break at the pedal hole, seems a logical place. Near net forging, as used in many jet engine parts. Very nice ! Thanks for offering additional sizes. Although I would be interested in an even longer size (183 mm seems to be the next logical extension), It seems that anything more than about 185mm or so would entail a custom frame design with high BB–something like the Zinn frames–to accommodate them. I currently use 180 mm on a stock frame without problems, but I’m not sure what the upper limit would be on most stock frames. Thanks for making these in 165! I’m curious about the pricing of the doubles vs single chainring… why is it the same? I’ve been keeping an eye out for TA cranks in 165, but they don’t come up very often. Time to start saving. The single-chainring cranks are made in much smaller batches, so they are more expensive. Fortunately, you save the cost of the second chainring, so it comes out even. I am glad to see that you have had sufficient commercial success with the RH cranks to justify introducing the new lengths. I bought a set of the original 171s, and have been very happy with them. From the beginning I wondered if they would be as successful financially as they were artistically and functionally. Seems like the answer is yes, which is great news. Congratulations on your accomplishments, and thank you for bringing such exceptional products to market. 2014 alloy was used by classic René Herse cranks and older TA cranks. It does get gray with age if you don’t wax it. We wax the cranks before they are delivered, and we recommend you wax them from time to time with a high-quality car wax. If they tarnish, you can polish them easily to a high shine again. OK, I was worried that corrosion could lead to pitting and stress corrosion cracking, but if it has been used, tested and tried in cranks that have been around for such a long time it should definitely be fine. Yes, 2014 is fine for cranks. 7075, on the other hand, has all the stress corrosion cracking issues that you mention. That is why it’s a poor material for cranks (but great for chainrings, because it’s so wear-resistent). Hi Jan. Thanks for this great article! I love my original 171 R.H. cranks. Up until I purchased them, for as long as I had been serious enough about my cycling to note crank arm length (30+ years? ), I had been using 175 length crank arms. I was a little skeptical therefore of your theory regarding all, except the most extreme cases, being able to use 171 without negative results. I went for it though and have never regretted it. I currently have three bikes, one with the 171 Herse’s and two with 175s. I switch between them often and really don’t notice enough difference to matter. Certainly nothing that consciously bothers me. If I were purchasing a new set today I would still go with 171s and I suppose the new higher grade alloy would be an added benefit over my “old” cranks. I’m afraid you’ve opened a bit of a Pandora’s box by offering these new sizes and I can see the need for more forging molds in your future! Still, I appreciate the progress you are making and your commitment to making the best parts that you can. I can’t help but wonder and hope that you will soon apply the same logic to tires and offer up some larger 700c/29er tire sizes! A really great article, thank you. I have to admit, I’ve never found any noticeable difference in crank lengths, having cycled just fine with cranks from 150 to 175. The science on crank length that I’ve been able to find seems pretty slim. Maybe an issue for VBQ (sorry!) to take up? I’m definitely in the camp that finds very noticeable differences in crank length. When I was a teenager, I had a bike with 165mm cranks and it always felt a bit different from my previous 170mm cranks. For a couple decades I rode 170s. In the late 80s I bought a mtn bike and thought the bio pace rings were causing knee problems for me, until I changed them to round rings and the pain persisted. I swapped them for 170s and the knee pain went away. In my 40s I started having knee pain again and switched to 165s, all things being equal, the 165s feel great on my knees. Seat tube angle can change the orientation of your hip flexors and that can affect how your spin feels. Adding 5mm thicker soles to your shoes can give you the same effect as lowering your saddle. I’m sure most people can feel a difference of a centimeter difference in saddle height. 5mm in crank length increases the circle of your spin by a full centimeter. When I ride to work, I wear my work shoes and they have thicker soles than my riding shoes, it is very noticeable. Perhaps not everyone is as sensitive to minor changes but when you start riding longer distances, very minor issues can become quite amplified. I am glad that we are now offering your favorite crank size! Not just my favorite size, but configured for sensible gearing., I expressed my gratitude by ordering a set. According to the calculations I have been able to find in “Das kleingedruckte beim Radfahren”. Your experiences are counter to to the calculated results which put smaller strain (torque) on the knee with longer cranks. Saddle position is also important not only saddle height but also horizontally ( where the knee is above the axle of the pedal). To have the same relative strain/torque on hip, knee and ankle as a 175 cm tall man has with 172,5 mm crank arms a 150 cm tall man would need 147,5 mm crank arms, and a 200 cm tall man 197,5 mm. Provided femur to height ratio is the same. Going from a 175 mm crank to a 185 mm crank You would still have to reduce saddle heigth by 9mm and move the saddle 7mm forward to keep the position of the knee above the pedal axle the same with normal seat tube angle. Based on my experience correct placement of cleats and position of saddle horizontally is the most important factor in regards to knee pain. If humans simply scaled, then taller cyclists would be faster. You’d just make them a bike that is 10% bigger in every dimension. With every revolution of the cranks, they’d go 10% further. Similarly, runners who are 10% faster can make 10% longer strides, so they should be 10% faster. Yet the fastest cyclists and fastest runners are no exceptionally tall. Lennard Zinn says that taller people cannot move their limbs as quickly. He compares it to a mouse that moves its legs so fast that they become a blur, versus a giraffe that moves its huge legs comparatively slowly even when it gallops. It seems that you have two choices: Spin cranks that are relatively short compared to your body height, or mash on cranks that are proportionate to your body height. Extra-long cranks have been tried many times in the history of cycling, but they don’t seem to work for every tall cyclist. Gert, I think you are addressing me. My issues developed more as a result of the longer cranks coming up higher at the top of my pedal stroke than anything else. I rode 170s comfortably for many years and never had an issue. I don’t think I’ve ridden 200,000 miles in my life but it’s well over 100,000 miles. Statistical analysis work great for averages but there are always individuals that fall outside those statistical averages. I could read scientific data all day but it won’t help me get a better fit on my bike. Decades of riding has taught me what works for me. When I get on my bike and I’m constantly reminded how great it feels, that’s all the data I need. I would be interesting to know the height ranges of users and their preferred crank lengths. I’m just over 6’2″, so not unusually tall. However, it’s mostly in my legs. My crotch to floor measure is almost 37″ in sock feet, and my BB spindle to saddle height is 84cm (33″). I also have longish arms (35″ sleeves on a fitted shirt) and feet (US 13/14 depending on fit). Typical bike fit formulas don’t work very well for me – I need a large frame with a shortish top tube (but not too short or my knees are hitting my elbows, and I’m riding for comfort, not speed). Obviously I’ve ridden many bicycles that didn’t “fit” over the years, but now I do like to tune them as much as possible, and crank length has become part of that. Fortunately, I get no pain when riding a good-fitting bike. Much further up. It is said that TA cranks are ISO, and that TA say they are. I can not reply up there. The ones I have bought in 2013 TA Vortex compact and last year TA Carmina compact are both JIS. The TA homepage and the accompanying instructions say ISO, but You need a JIS spindle. Usain Bolt is 6 feet 5 and Tom Boonen is 6 feet 4, Marcel Kittel is 6 feet 2, Cancellara 6 feet 1. Being 6 feet 5 my self, I would say that is normal height. But I think it is well above world average. It doesn’t change that the three cyclists use relatively short cranks. Kittel 175 mm and the others 177.5 mm. So crank length being out of sync with your body dimensions do not prevent you from being fast. Also there is no information that they should be suffering more from knee problems than riders with relatively long cranks. All I am saying is that to keep the same strain on the muscle around the hip, knee and ankle then crank length should be relative to leg length. The different lengths of Rene Herse cranks make much more sense thank the three typical lengths of 170, 172.5 and 175 offered in the reasonably priced versions by the larger manufacturers. With the 177 mm and being up to 6 feet 4, You should at least be able to go as fast as Boonen without the crank length holding you back. The 177 crank looks perfect for my new bike. Now if only we can get some larger size clothes for the people who used to play in the front row of the Rugby scrum. Cycling has reduced me from a 4XL to a 2XL and while ‘Fat Lad at the Back’ and Assos can fit us out in lycra, I do hanker for a pair of Compass Knickers. May I digress and say how I couldn’t figure out the naming convention of the Assos sizing scheme. They have a size TIR which they describe as XL but wider. Fair enough, I thought, they fit me like a glove but where does TIR come from. Then I saw a photo from our European trip come up on my screen saver and there was a TIR plate on the back of a large, heavily laden semi trailer and it clicked. Nice to find a sense of humour in the most unexpected place. AFAIK TIR stands for “Transport International par la Route” and is an international agreement for movement of road cargo across borders! SP is Servicio Publico.. it’s a license for certain types of vehicle. At 6’3″ I raced for years on 175mm cranks. However when restoring an older racing frame, the longest SR crank I was able to find was 172.5 (a late unfluted model). To my surprise, I found that I could climb and sprint faster on the shorter length crank, and have since replaced all my cranks with 170 and 172.5 mm lengths. The difference seems to be that I can spin the shorter lengths faster, and suffer less fatigue, which more than offsets the extra leverage provided by the longer length. (By the way, I can barely tell the difference between the 170 and the 172.5, but the jump up to 175 is very noticeable!). I’m saving up for a set of the 171mm Herse cranks, I think they’ll be perfect!